Sorry folks, we have been off the blog radar for a long while. No excuses. Just very busy. I am writing today about our trials and tribulations with the process of setting up Café Arpan. Hope you enjoy reading this as much as I have enjoyed writing it. Incidentally, this will be our last blog post because very soon we are `Serving Fresh’. Stay tuned! When we began the journey for Café Arpan in late 2017, it was with the belief that more supported employment initiatives grounded in the F&B industry was the way forward. 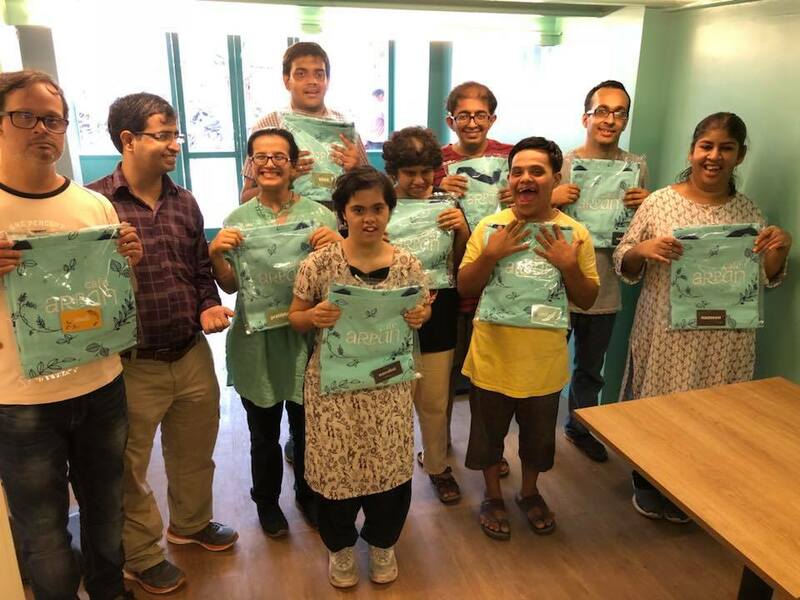 We had already been successful in running our dabba service and our beneficiaries’ enthusiasm, skills, and satisfaction led us to believe that we should explore other similar options. We had no doubt of the viability of our project. We crowd funded, gathered resources and began a hunt for space. We finally settled on a 400 square foot space not far from our current location in Juhu. It had a bathroom, its own independent water connection and was, in all ways, perfect. Or so we thought. There was a mezzanine which was being used as an office space and some storage. Our initial thought was to do away with the mezzanine because the space would look bigger, but the owner and builder both warned us that the BMC would come after us if we did that. Little did we know that they would come after us anyway – this innocuous structure would cause much grief. The designers who took on the project were friends and family members who believed in us and the value of our work. They donated their time, energy and efforts. They received, in turn, love, attention and warmth. What can be a monetary value for the latter? The trudge to BMC began. Friends and acquaintances who had been in the business advised us plenty. Our well wishers spoke to everyone they could think of: from the local MLA, to the corporator, to social workers, even to officials in the MMRDA. It was the same story. Bribe. Or forget about it. The advice just varied with the amounts. And everyone seemed to be in the know. Were we being naïve or stupid? Was the project truly unattainable without these `personal incentives’? We even met with an agent to understand how the system worked. It was disgusting. Fortunately, our Board of Trustees were unanimous in their views. As an NGO, we seek public funds. We are accountable to our donors for the use of those funds. In reality, could we tell them: “Well, we used your donation to pay off BMC officers”? Certainly not. In our view. Not with donations that were being made to us in good faith. Besides in principle, we did not want to support this parallel economy. Not too long-ago the BMC adopted an on-line application system. The reasons are great – efficiency (ease of doing business) and reducing corruption. Within this new system all applications have to be dealt with within 30 days or they get kicked out of the system. On the website, there is even a flow chart of which department needs to do what in how many days to facilitate the forward movement of the application. In theory, it is a great move in the right direction. In practice, the deadlines are not met. We applied for a permit to run an `eating house’ (sounds so much more ominous than the little café that we had in mind, but there were no other suitable options). We had also planned on using electric-only appliances. The mezzanine, although considered regularized by the building department, was not acceptable for use to the fire department. No amount of pleading our case helped. They were hell-bent on following rules and needed official documents about the 25-year-old mezzanine. Nobody had them because of the age of the building and record keeping in the old days. By the end of four months, they all knew me. “Dr. yaa basa. Chaha anu ka? (Dr. come and sit here. Shall I order some tea?). NO! I wanted to scream. Just move our application(s) forward! Of course, I sat and had tea instead. Our Board was often on the verge of giving up and as a last resort bribing with their own personal funds – but we pulled ourselves back and continued the visits and paper pushing. Four applications later, we knew the `route’ and had all necessary phone numbers on speed dial. And we trudged. Finally, our patience, persistence and teamwork paid off. It cost us less than Rs. 15,000 and we did not cave in. It felt very good indeed! Now, we have a beautifully designed space, a menu that is interesting and easy to execute and an enormous sense of confidence that we are indeed on the right track. Our team members, wonderfully committed, hard-working individuals, are enormously excited! Hat’s off to you Sush and your team, the supportive board and yes, even to those who finally signed on the dotted line. We will soon see how Cafe Arpan will create more magic. Persistence pays, and you show us how. Wait to be there! All the best! Great efforts! Congrats & wishes. Hats of to entire team..
Great work ..hats off to you .Wish you all the bests ..God bless !! With lots of warm wishes always. We support different orphanages to effectively run their Shelter homes by assisting them in basic & critical expenses like Shelter, Food Education, Clothing, Medical facilities etc. Every child has a hunger for home, not only for a place to sleep but for a place that can provide safety, love & care.